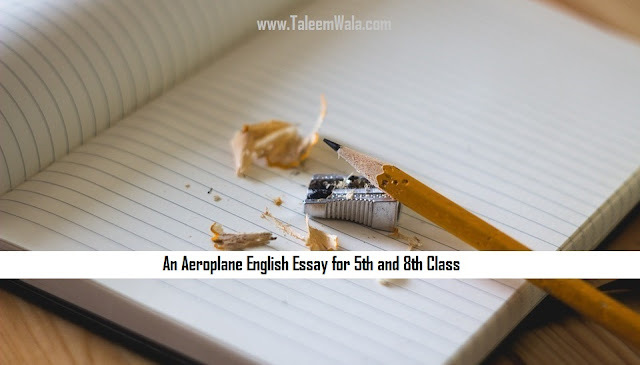 This is a great and original note on An Aeroplane English Essay for 5th and 8th Class students in Pakistan. You can recommend this essay to your students in Pakistan and make them easily use this easy wording essay. Aeroplane is the fastest traveling from one place to another. There are many kinds of aeroplanes. Some are used to carry the passengers e.g. Boeing, for cargo handling, e.g. C-130 and for private use e.g. Cessna. Some of them are jet fighters which are used to attack the enemy hideouts e.g. F-16, F-18 etc. Every plane is comprised of four basic components i.e. at least two engines, two wings, a number of propellers and a tail. A passenger and cargo plane can fly at an average speed of 600 to 800 miles per hour. But the jet fighters can fly many times faster than the speed of the sound. Now, the Air France has introduced the most modern plane. Its model is A-380. It is the world’s first double-decked passenger plane with all the seven-star hotel facilities. It has a swimming pool, a club, a pub and many other entertaining facilities. In short, Aeroplanes have shortened the distances and made this world a global village. If you need to get more essays for kids and want to read more related essays then search at our website (www.TaleemWala.com) and also stay connected for more.